This year’s Freakin’ Weekend just got a little sweeter with the news that our favorite brunchin’ babes at the Stone Fox will be hosting a hangover show Sunday afternoon, and we couldn’t be more stoked. This is the first tour for Fletcher C. Johnson, though we were lucky enough to catch him opening for King Tuff at the Other Basement a couple years ago, and from what we remember, the dude only writes hits. 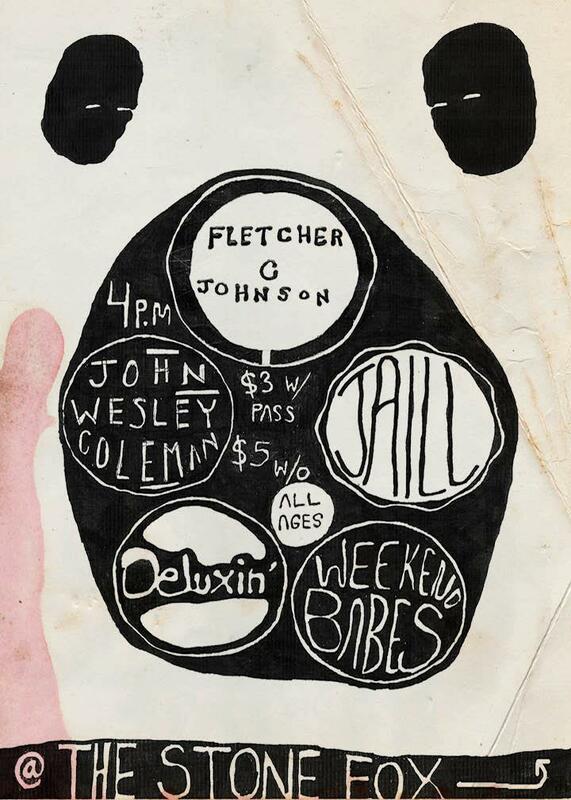 Our favorite ex-Golden Boy/current Goner artist, John Wesley Coleman, is also playing. Last of the out-of-towners is Jaill. They’ve been around for a while and their newest record, last year’s Traps, made quite the splash around the blogosphere. Local messy-pop masters Deluxin’ and teenage newcomers Weekend Babes are rounding out the bill. Do it.